Cooking with seafood really marks the summer months for me. Seafood dishes tend to be lighter, bursting with freshness and are usually ready pretty quickly. This dish was supposed to be made into a seafood medley served with buttered spaghetti, but, after a day spent at the beach - nibbling at freshly purchased red berries and soaking up the sun - a very light meal was calling my name. The clams were deliciously soothing served with a couple slices of crusty garlic bread to soak up the sauce. There really is something about the sauce that emanates from cooked clams. When you cook clams this way, they release their wonderfully fragrant flavors into the wine and create the most flavorful stock. If you don't want to use up all cooking liquid, try using some of it in risotto or with any seafood pasta dish. You really can't recreate the depth of flavor that the clams create. They're nothing like it! Remove the leaves from the thyme stems and coarsely chop. Add the thyme stems, leaves, white wine, garlic and clams to saucepan on medium heat. Cover. Bring the stock to a boil and reduce to a high simmer for about 3-4 minutes.Shack the pan being careful to secure the lid down to make sure the clams open. Place all the opened clams in your serving bowl and discard any closed ones. Discard the thyme stems and simmer the stock for another 5 minutes. Add the lemon juice to the sauce and pour the sauce over the clams. Add the cilantro and serve immediately with some crusty bread. Enjoy! Lovely photo (especially the light on the glass). I'm still learning to love the bivalves, but your post has even me yearning for a taste. My favorite little gourmet restaurant in town serves a dish like this over angel hair pasta. I order it nearly every time!!! You gave me inspiration to just try to make it on my own! Thanks! I can't wait to try this recipe. With dishes like this, the best thing is dipping bread into the sauce at the end! The clams look so amazing. I miss cooking with shellfish. My daughter developed an allergy to shellfish and just the cooking shellfish in the house sets her off. The rare times when we can indulge is such a treat. Going to tuck this recipe aside just for one of those times. Growing up on the east coast clams were a frequent indulgence. I have not had them in some time. You are right, simple preparation with wine and buttered pasta is complete bliss. Thanks for bringing back happy memories. Your photos are simply gorgeous. I love the simplicity of the recipes as well. Very nice, indeed. Your photo makes me feel (know) I am missing out, not being a mussels gal. Beautiful post as usual! Kate Morgan Jackson: Thanks, I'm glad you're enjoying them. If you're ever in the Montreal region, let me know! 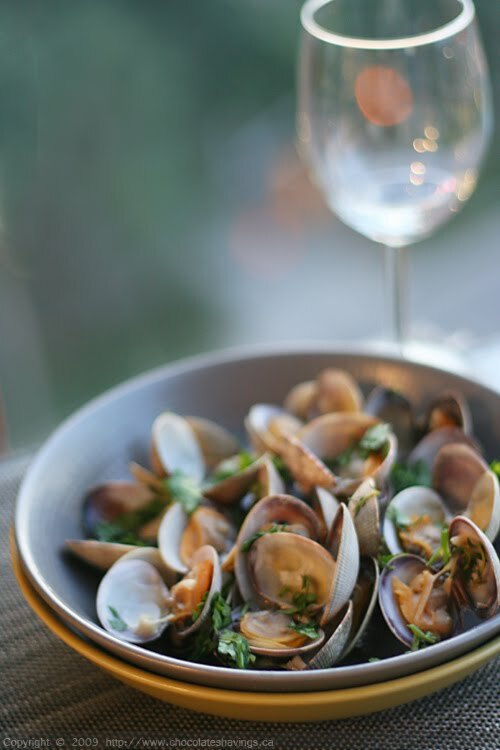 I absolutely love clams, but never cooked them at home! You have encouraged me to do so! THANK YOU! Looks simple & delicious! Perfect for summer, indeed! Great pic!